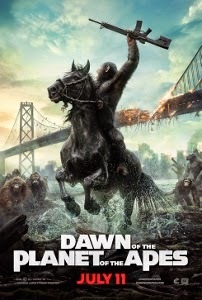 Maybe it’s the relative lack of well-crafted spectacle at cinemas so far this summer that has so many critics falling over themselves to praise Dawn of the Planet of the Apes. This sequel to 2011’s Rise of the Planet of the Apes delivers admittedly awe-inspiring CG effects, with Andy Serkis deservedly top-billed for his motion-capture work as ‘head ape in charge’ Caesar. The depth of soulful emotion in the facial expressions of his and the supporting apes is among the closest I’ve seen to true photo-realism in digital characters. The impressive Golden Gate bridge finale of Rise was only the warm up for the full-on ape/human war we see in Dawn. But for those craving more than effects wizardry, prepare to be disappointed in this overlong (131 minutes), predictably-plotted sequel. Act one gets off to a promising start, with Earth’s human population decimated by the ALZ-113 virus introduced in Rise. The apes have quickly established a relatively complex society, led by Caesar – whose ailing wife Cornelia (the ubiquitous Judy Greer did the motion capture) has just birthed a second child. The entirely subtitled opening sequence (the apes communicate primarily via sign language) casts an appropriately otherworldly spell as we’re introduced to just how sophisticated the apes have become. Their world is rocked, however, by the sudden intrusion of humans. 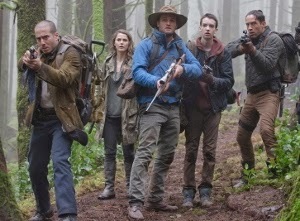 These people, led by Malcolm (Jason Clarke), have a natural immunity to ALZ-113 and are attempting to restore power to their nearby base by repairing a generator at a dam. 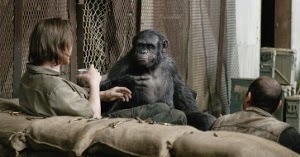 The problem is, the dam is on the apes’ turf and an uneasy truce must be agreed upon for Malcolm and his people (which include Keri Russell as his wife Ellie and Kodi Smit-McPhee as his son Alexander) to forge ahead. While Malcolm is genuinely trustworthy and gains Caesar’s skeptical trust (he reminds Caesar of the James Franco character who raise him in Rise), there’s trouble brewing back at the human base. 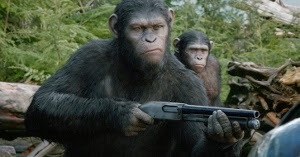 Led by the anti-ape militant Dreyfus (Gary Oldman), they’re fixing to wipe out the intelligent primates. Caesar has dissent among his own ranks, with Koba (Toby Kebbell did the motion capture) emerging as a violent, anti-human leader. The pacing is so slow throughout Dawn, it’s not hard to deduce where this is all going (plus the theatrical trailer pretty much outlined the entire thing already). Anytime humans are onscreen, Dawn becomes a dull B-movie. The lack of meaningful communication between Malcolm’s crew and Dreyfus is confounding, as a little more urgency on Malcolm’s part might’ve alleviated some of the ape/human tension. Of course, it also might’ve forced the screenwriters to concoct more imaginative plotting. One fascinating aspect of the original Planet of the Apes series was how creative – and even thoughtful – the filmmakers continued to be, all while working with ever-diminishing budgets. They fought to instill social allegory and adult themes in a series of films that were increasingly regarded as kiddie flicks. Following the success of Rise, 20th Century Fox has thrown everything but the kitchen sink into ensuring that Dawn is an A-list blockbuster. It’s not enough. Compelling human characters and suspenseful storytelling are all but missing from this largely technical exercise. There’s no exhilaration, no sense of true wonder. And to top it all off, director Matt Reeves (Cloverfield, Let Me In) maintains a bitterly humorless tone. The material is presented in a deathly serious manner, completely eschewing the satirical elements that played a big part in the original cycle of films. Ultimately, Dawn is nothing more than another clash between two societies; one which arrogantly perceives itself as superior due to possessing more highly-evolved intelligence (and firepower), and another which overcomes technological shortcomings by sheer force of will. The portentous, self-serious aura ensures a superficial sense of gravity that keeps Dawn from feeling like the out-and-out silliness of junk like The Amazing Spider-Man 2. But the end result is decidedly second-rate filmmaking produced on an extravagant budget.